Last weekend, Neiman Marcus at Tysons Galleria treated a few member of the press to a preview of Fall 2012 fashion, beauty, and home trends. I was lucky to be invited - to learn and drool. What's "in" for the coming season? We got to see, hold in some cases, and experience autumn. Here's "the list." Mixed Greens. Solo or in combination, greens are the color for fall. Greens will spruce up any wardrobe - and fit right in with mine. Navy. The New Neutral. Navy! Finally, navy is back in style, after way too many years of black. Pair it with black (which Giorgio Armani did long ago) or brights. The Jacket. The menswear trend, a tailored jacket, goes over everything, even evening dresses. Keep it at the top of your mind. The Smoking Slipper. This flats lover is overwhelmed with the gorgeous offerings for fall. The luxury loafer and embellished flats are "flat-out chic." The Leather Leg. Second-skin tight or cut like a trouser, leather has legs this fall. The Statement Handbag. Size, shape, and details speak volumes. Wear it in green or navy for the trendiest look. Borrowed from the Boys. Menwear influences are all over tailored fashions for women. Digital Prints. Patterns made modern adorn everything from jeans to dresses. Brooches. Finally, you can bring out grandma's brooches - or new ones - and be right in style. One brooch adds newness; a cluster adds drama. The Fall Face. Get juiced with the cherry lip. Red is big for fall and winter, and the shade of the season is cherry. Nathaly Callado was modeling the cherry red lip as she showed us the latest in beauty. What else caught my eye? 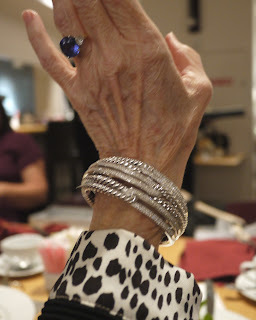 I flipped over this David Yurman bracelet. For a mere $8,500, I could have it! This is one of the most exciting fall seasons I've seen in the last few years. Now, I'm off to buy a Powerball ticket. CG, thanks so much for the report. I'm happy to hear that embellished flats will be back. I think they're pretty, and my feet love them. I love navy, too, and I like several shades of green, especially emerald. Personally, I don't follow color trends in clothes. I'm a bit surprised to hear that cherry red is the shade for fall. I thought it was deep wine. No matter, I adore both. That bracelet is stunning, but frankly, it's your ring that draws my eye. Gorgeous! Thanks so much for this. It's such fun! My favorite ring. I designed it after buying the tanzanite a LONG time ago. Fall has trends I can get behind. I just want to hang out with you for an entire day :) Love Fall trends. LOL, Beauty! It would be boring - really. Only a few days/week are exciting.